Texas A&M has made a name for itself in the most competitive football conference in the country, the SEC. The sold-out crowds, active alumni network, and internationally recognized brand tell the story of Aggie football’s success. Texas A&M is known for its traditions, including those that have been around for a century or more. In recruiting for its football program, the university faced a tough challenge due to these traditions. For potential football recruits, tradition could translate to old-fashioned. In 2013, we partnered with head coach Kevin Sumlin to develop a new strategy to change the perception of the football program, enhance brand awareness, and make the program relatable. This approach would position Aggie football as the epicenter of conversation and interest for the nation’s top recruiting prospects. "There's a perception out there about who we are, and what this platform gives us is a way to show recruits what our players really do and what life is like for them in College Station." Texas A&M is a historic football program with a rich history. Tradition and rich history aren’t exactly the buzzwords that appeal to young 4 and 5 star athletes when you’re recruiting them. We needed to respect what Texas A&M had built over 100 years but also help them to keep that rich history by speaking to their recruits in a way that resonated with them. We also had to engage with the athletic department and Adidas to get all three of our voices on the same tune. A massive revamp of Texas A&M’s digital and social presence was needed because the Aggies’ channels didn’t tell recruits the full story of what Aggie life was like for football players. Our main objective was to develop an integrated campaign and strategy that helped Texas A&M sign the best recruiting class in history. LeverageSports was born and bred in Texas and it’s leadership team had experience playing collegiate football. We needed to use our expertise as former African-American athletes to speak to the recruits in such a way that signing with Texas A&M was the best choice to continue their athletic career on the next level. We wanted to implement a strategy that would appeal to recruits and their families but still respected Texas A&M’s rich football history, which was no easy task. We also needed to change the way they used digital and social media. We wanted to establish a relationship with the athletics marketing department and with Adidas so that all three voices were unified for this campaign. A responsive website where recruits and coaches could constantly communicate without interruption needed to be created as well as a custom mobile app with content that resonated with recruits. Lastly, we wanted to help Coach Sumlin control his message to recruits at all times. We gave the Texas A&M football some new swagger while keeping their substance. We did this by creating AggieFBLife.com, a responsive website with content to keep users engaged. We spoke to the recruits and used vernacular that they knew and understood. We also respected A&M’s time honored traditions. We were able train the athletic department staff on how to shoot lifestyle images which we used to give the program new life in social media by enhancing their conversations in Twitter, Instagram, Spotify and Snapchat. We also were able to align with Adidas and help them communicate new uniform releases via Twitter. In 140 characters, Texas A&M news was fresh, hip, and relatable to young kids and easily understood and respected by adults. 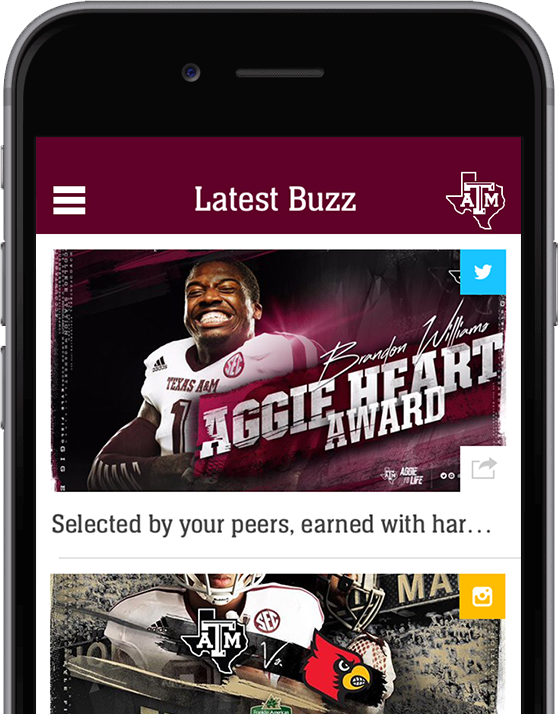 We also designed, developed, and deployed a custom mobile app across iOS and Android devices that allowed coaches to control their brand message with authentic, original and exclusive content highlighting the experience of an Aggie football student-athlete. We created environmental graphics for Texas A&M’s equipment truck and football facilities to extend the brand experience that’s seen by fans and recruits during home and away games. Our efforts helped land us more press than we could ever imagine. Our A&M rebrand was featured in ESPN, ESPNU, SB Nation, NBC Sports, Yahoo Sports, CBS Sports, USA Today Sports, Fox Sports, Complex, Sporting News and ESPN College Gameday. Our AggieFBLife campaign is now considered the model and standard for college football recruiting according to a recent article in Sports Illustrated written by Senior Writer Andy Staples.